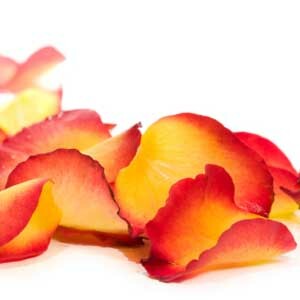 Rose petals are an excellent way to add splashes of color to any event, not to mention the convenient and affordable option for brides and other DIY designers. You can sprinkle them on tables, layer them around a cake, line the wedding aisle or simply have a flower girl carry them. 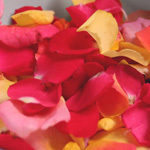 Rose Petals are sold by the gallon or half-gallon and come in a variety colors. You can choose one solid color or a mix of up to three colors. Still not sure how many rose petals you need? Ask the Experts for a suggestion! Red, yellow, white and pink with an occasional request of orange. Note: This product has seasonal pricing.